Is the most complete text available about the Modelica language and its model component libraries. The second edition features improvements and updates of the Modelica language including synchronous clocked constructs, examines basic concepts of cyber-physical, equation-based, object-oriented system modeling and simulation. Prof. Fritzson introduces the Modelica class concept and its use in graphical and textual modeling with several hundred examples from many application areas and explores modeling methodology for continuous, discrete, and hybrid systems; and more. This text is aimed at System Modeling and Simulation engineers, control engineers, mechanical engineers, those working with CAD (Computer Aided Design), virtual reality, biochemistry, embedded systems, and data communication. Peter Fritzson, PhD, is Professor and Research Director of the Programming Environment Laboratory within IDA, Linköping University. Prof. Fritzson is also Director of the Open Source Modelica Consortium, Director of the MODPROD Center for Model-Based Product Development, and Vice Chairman of the Modelica Association, all organizations he helped to establish. Previously, he has served as Chairman of the Scandinavian Simulation Society, Secretary of EuroSim, and a Project Leader at Sun MicroSystems California. Paperback 1250 pages 2014 ISBN 9781-118-859124 The book can be purchased on Amazon and Wiley. This book teaches modeling and simulation and gives an introduction as well as a very comprenhensive overview of the Modelica language including many examples. Moreover, about one third of the book is devoted to application examples and related application background theory. Many of these examples are available in downloadable executable form in the OpenModelica installation from the OpenModelica.org web site. Part four of the book gives an overview of the most important symbolic and numeric methods used in typical Modelica tools. Appendices include parts of the Modelica standard library. The whole book is 940 pages long. Book excerpts. The book is aimed at teaching Modelica modeling and simulation to beginners, or in courses where there is only limited time for an introduction to Modelica. 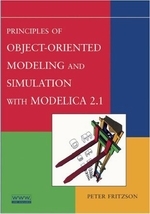 However, if you already have the big book "Principles of Object-Oriented Modeling and Simulation with Modelica 2.1", you will not need the new book, except for teaching introductory courses. The book is 232 pages, uses downloadable exercises availabile here, and uses the Modelica language standard version 3.1. The introductory book "Introduction to Modeling and Simulation of Technical and Physical Systems" by Peter Fritzson has been slightly updated, translated to Chinese by Fanli Zhou and Liping Chen, and published by Science Press in China. Suzhou Tongyuan organized the translation work. It is aimed at teaching Modelica modeling and simulation to beginners, or in courses where there is only limited time for an introduction to Modelica. The book provides exercises, and uses the Modelica language standard version 3.1. The translated book will be available in print in November 2015 from Science Press. The introductory book "Introduction to Modeling and Simulation of Technical and Physical Systems" by Peter Fritzson has been slightly updated and translated to Japanese by Tomohide Hirono, reviewed by Akira Ohata, and published by TechShare through the efforts of Takaaki Shigemitsu. It is aimed at teaching Modelica modeling and simulation to beginners, or in courses where there is only limited time for an introduction to Modelica. The book provides exercises, and uses the Modelica language standard version 3.1. The introductory book "Introduction to Modeling and Simulation of Technical and Physical Systems" by Peter Fritzson, copyright (English version) by Wiley-IEEE Press, has been slightly updated by Peter Fritzson and translated to Spanish. The translation of a previous version of this book was done by Sebastián Dormido, Madrid, Spain. José Luis Villa atTechnical University of Cartagena de Indias, Cartagena, Colombia, translated the updated parts and updated the current version, including the new appendix. It is aimed at teaching Modelica modeling and simulation to beginners, or in courses where there is only limited time for an introduction to Modelica. The translated book is downloadable from, and uses the Modelica language standard version 3.1. 105 papers from Modelica'2009, at Como, Italy, Sept. 20-22, 2009. 82 papers from Modelica'2008, at Bielefeld University, Bielefeld, Germany, March 3-4, 2008. 81 papers from Modelica'2006, at arsenal research, Vienna, Austria, September 4-5, 2006. 65 papers from Modelica'2005, at Technical University Hamburg-Harburg, Germany, March 7-8, 2005. 42 papers from Modelica'2003, at Linköping University, Sweden, November 3 - 4, 2003. 41 papers from Modelica'2002, at Deutsches Zentrum für Luft- und Raumfahrt (DLR) in Oberpfaffenhofen, Germany, March 18 - 19, 2002. 21 papers from Modelica'2000, at Lund University, Lund Sweden, October 23 - 24, 2000.